A Kentucky high school suspended two students for reportedly dressing as the 1999 Columbine shooters who were responsible for one the worst mass shootings in the U.S.
Adair County High School suspended two girls who allegedly dressed as the Columbine shooters for Halloween, ABC News affiliate WHAS11 reported Thursday. The two girls wore clothes resembling the ensemble that shooters Dylan Klebold and Eric Harris wore. The girls reportedly posted pictures of themselves mimicking the bodies of the shooters after they committed suicide alongside real photos of the suicide. “We take the situation very seriously and our personnel are continuing to investigate the facts and circumstances surrounding this matter,” Adair County Schools Superintendent Pamela Stephens said in a statement, WHAS11 reported. Many parents are angry the girls did not receive a more severe punishment. “I think any child that does that should be expelled and any parents who [support] their child [doing that] should have charges brought against them,” said Amy Tarter, parent of a student at the high school. “You worry every day about sending your kid to school, and now you have people joking about it,” Tarter said. 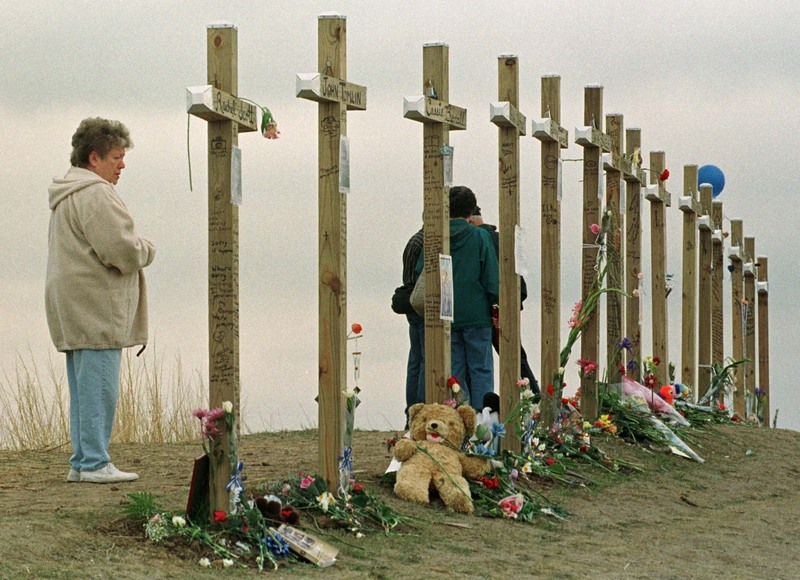 Students at Columbine High School walked out of school on April 20 to commemorate the victims who died in the 1999 shooting.